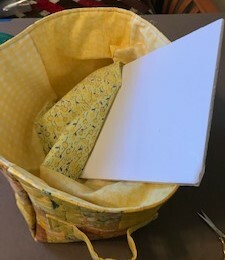 As promised, I worked up a tutorial for the fabric scrap boxes. Please let me know if anything is unclear or if you need any additional pictures. Gather together your scraps. 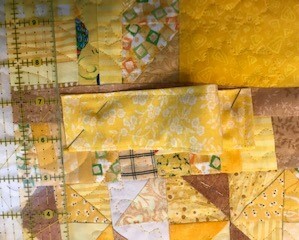 I'm working with yellow this time, but choose your color and then gather together everything that you think might work. 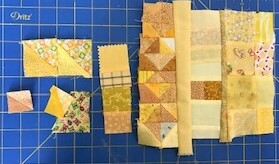 Leftover triangles, odd ends from strip sets, orphan block, anything goes! In addition to the crumbs and strings, you will also need a few larger bits for lining. 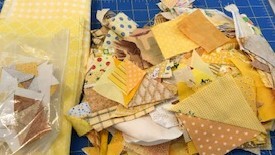 Don't worry about choosing your prettiest scraps for these, they won't show. First step: make fabric. Start with small bits of fabric and leftover chunks of whatever you have on hand. Sew similar sized units together and then sew those to others. Keep going until you run out of bits that fit together nicely. 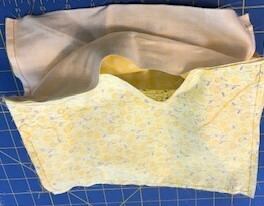 Straighten up an edge and then use a long strip of fabric to join two of these chunks together. You are aiming for two rectangles about 8 by 11 and two squares of about 8 inches. Keep that in mind so you don't go overboard and make enough fabric for an entire quilt. Press and straighten edges with a rotary cutter as you go to keep joining chunks together. 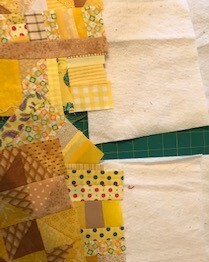 When you have two squares and two rectangles of crumb fabric ready to go, dig into your batting scraps to find some batting to cut into two squares and two rectangles as well. 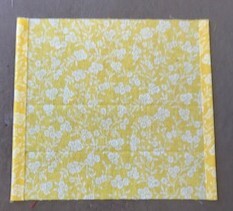 They are about the same size as the crumb fabric you just made: 2 rectangles 8 by 11 inches and two squares 8 by 8 inches. Try to find a batting scrap that is fairly flat and even. Warm and natural works well or something low loft -- heavy on cotton and light on polyester. Everything so far is slightly over-sized, so don't worry if it isn't quite perfect. 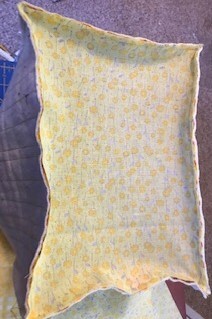 Layer the batting with the crumb fabric, wrong sides together. You can trim them to the same size now or later. The lining comes later, so it is just a two layer quilt sandwich for now. Secure your quilt sandwich together with a few straight pins as a very temporary measure. You will be quilting these and each is quite small, so the pins won't be around for long. Please don't poke yourself. Use safety pins instead if you are accident prone. Quilt each section as desired. 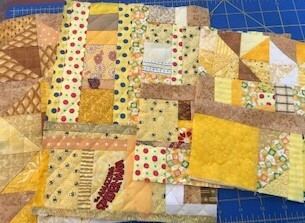 I like to use a matching thread and just go crazy with lots of different quilting patterns. You can use a walking or darning foot if you have them. Feel free to try out the fancy decorative stitches that come with your machine. If you don't have any of these, don't worry. 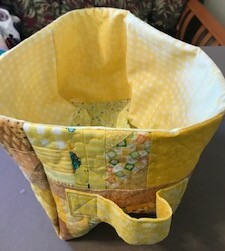 My main machine is in the shop right now, and I quilted these up with a regular foot on a cheap backup machine and had no problems. Just work from one side to the other methodically and smooth the fabric as you go to avoid puckers. With just two layers, shifting and puckering shouldn't be too much of a problem. 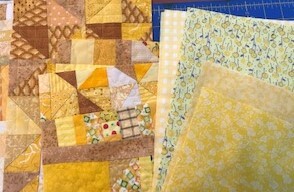 Now that you have made your quilted fabric, you are ready to cut out the rest of your pieces. 1. 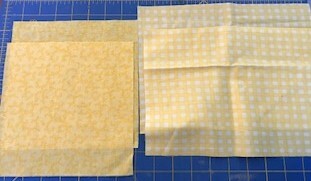 Square up your quilted crumb fabrics: 2 rectangles 7.5 by 10.5 and two squares 7.5 by 7.5. 3. Cut two rectangles for the bottom inside and outside, they are also 7.5 by 10.5. 5. One piece of firm cardboard or foam board which is cut 7 by 10 inches. A note on sizes. This pattern can easily be modified to make a box in any size. I looked at the shelf where I wanted the boxes to go and figured out what I thought would work there. I've made smaller cubes before and they seemed too small to hold a decent amount of scraps. Though they work great for notions and supplies. Make something that will work in your space to hold the things you want to put in them. 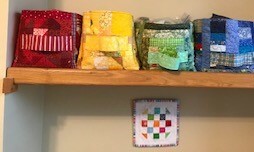 Pick the prettier of your two quilted squares and call it the front. Pin the handle so that the edges are about 1.25 from each edge. Center it top to bottom. Sew the handle down by making a square around each end and add another X down the center for added stability. 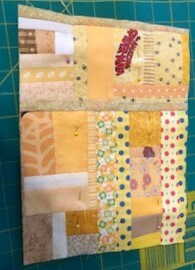 Sew the short end of each rectangle to the side of a square. This well be sewn to the bottom, so it is important NOT to sew all the way to the bottom edge. Stop a quarter of an inch before the edge and back-stitch. 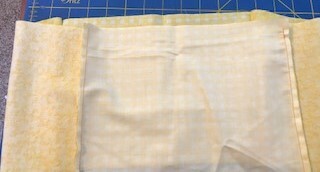 Continue to sew the sides together until you have a tube with two squares and a two rectangles. Make sure that the handle is oriented sideways -- not up and down. 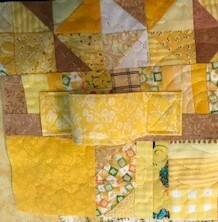 Now the tricky part -- pin the bottom to all four sides of your quilted fabrics. 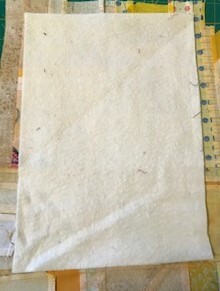 The corners should nestle in because you didn't sew the sides all the way to the bottom. 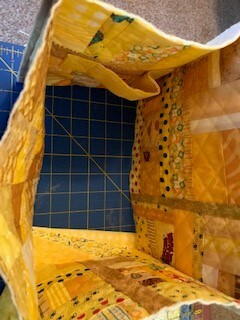 The right side of the fabric is facing to toward the right side of the quilted fabrics which are all on the inside of the box. Match the raw edges together and pin liberally. 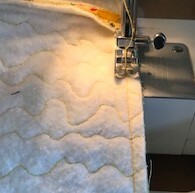 Start in one corner on a long edge, a quarter of an inch in from the end and sew straight down, stopping a quarter on an inch away from the other end. Back stitch and remove the box from the sewing machine. 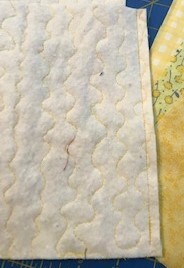 Fold the sewn edge out of the way and line up the next edge, making sure that the raw edges are lined up and the corner not bunched under the sewing line. Start where your stitching line stopped on the last seam. Your stitching should not go out into the corner. Repeat for the remaining sides. Here is your finished box. It is right side in, but you can see how the corners work. Repeat the above procedure for the lining fabric. Sew the two ends to the two sides and sew those together to make a tube. Don't forget to stop sewing a quarter of and inch before you get to the bottom. This will be somewhat flimsier than the outside, but the sewing is the same. Before any turning happens, we need to sew the inside and outside together. 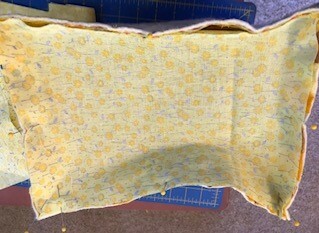 With right sides together, nestle the lining box inside of the quilted box and pin the raw edges together. 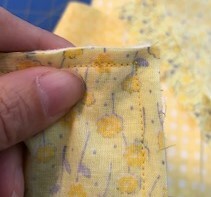 Sew all around the pinned edges, making a large circle. Keep going until you get back to where you started. 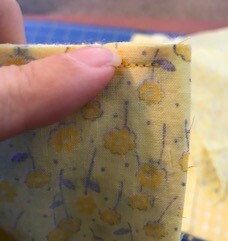 When you come to the corners, finger press the seams open and sew them flat to reduce bulk. Now the moment of truth! Turn the whole thing right side out by pulling everything out through the long gap that you left in the lining. Poke out the corners to make them pointy and trim away excess bulk if you need to. Press the top to make a nice crease where the inside meets the outside. Stitch along the top edge about a quarter of an inch from the edge to add some stability and shape. Now is the time to insert the cardboard base. Go ahead and tuck it in and take some time to get it nestled nicely amongst all of your seams. You will need to sew up the gap that you left at this point. Usually I would whip stitch by hand, but given that this is the inside and won't really be seen, I just fold a fake seam allowance under and sew close to the edge. These make such a happy collection sitting together on a shelf. Hopefully by the end of the year I will have a whole rainbow to enjoy. Guessing or tricking? I love these baskets. My friend has made a whole range of colours. They are great. 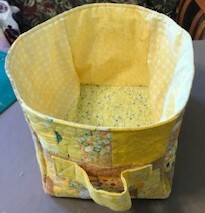 Thanks for the box tutorial from made fabrics... I WILL be making these soon! fantastic tutorial! 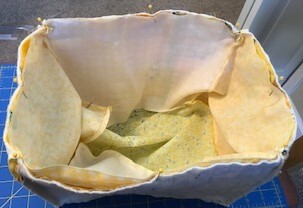 I have made my scrap bins with cardboard covered with crumb fabric adhered with home decorator fusible. I may have to go back at attach a handle...! Looking forward to the Tiny Tuesday from one week to the next. How ingenious is this! Neat way to store scraps! Hats off to you nice tutorial! Great tutorial. I'm going to have to give it a try. Is it safe to assume YELLOW is the color for February? Love the tutorial! Thanks, Angela. Thank you for the tutorial. I will have to try this. My scraps are in plastic shoe boxes. These would be so much better and prettier. Thank you for this helpful tutorial. I copy and pasted this into my computer for future reverence! Hope that's OK. Makes a pretty show. Do you save similar colored scraps in these? What fun gifts they would make too!